In the past week a fish, which has been given the name Mike the Murasoi, was captured in the waters off Japan’s Fukushima nuclear plant. 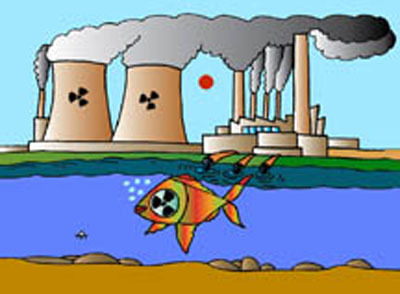 This fish reportedly had radiation levels more than 2,500 times the maximum allowed for human consumption. Radiation levels in Mike are 10 times higher than those measured last August in scorpion fish caught near Fukushima. The discovery of high levels of radiation in Mike comes just weeks before the second anniversary of the disaster at the Fukushima nuclear plant and has rekindled environmental and food safety concerns. Mike was caught by the plant’s operators inside a 20 kilometer area, near the plant, that is closed to humans. Surprisingly, Mike showed no obvious physical abnormalities (see below). Beel thinks giving “Mike” a cutesy name is really smart public relations. It kind of makes this whole thing fun, rather than a serious environmental issue. 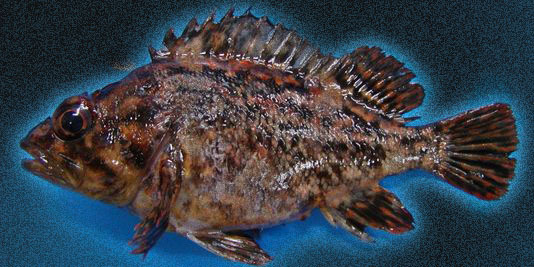 The murasoi Sebastes pachycephalusis is a member of the rockfish family, Sebastidae. Rockfishes, including the murasoi, generally feed on fish and various bottom-dwelling invertebrates. Murasoi live and feed on the bottom. They do not move extensively. Therefore, they are good indicators of local concentrations of environmental pollutants. In this case, radioactive 137cesium. 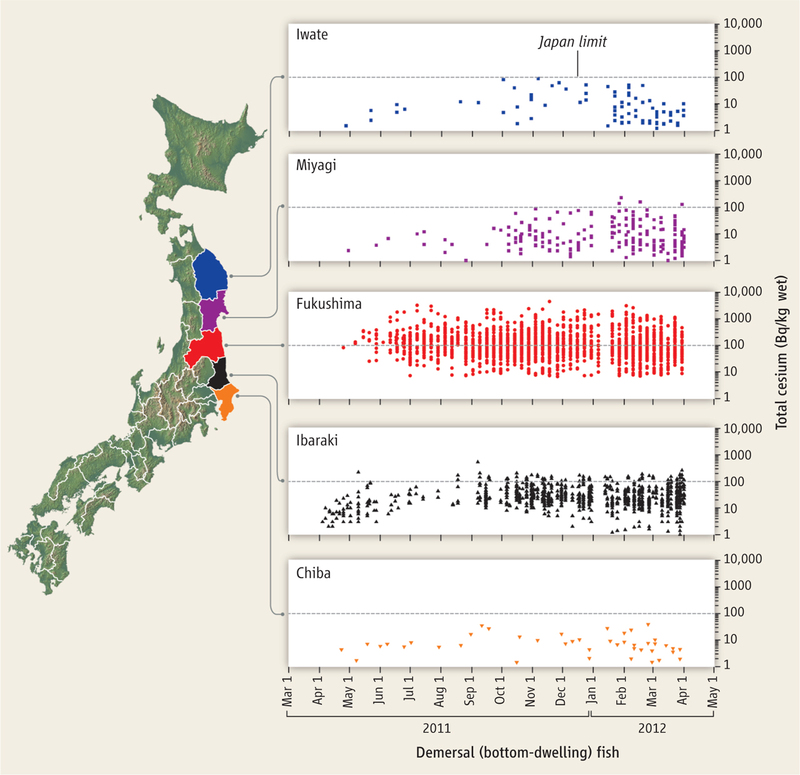 A paper published last fall by Ken Buesseler shows some really interesting spatial and temporal patterns in cesium concentrations in fish captured from along the Japan coast that are worth considering. Please, friends, let Beel present a figure from Buesseler’s paper. This figure shows total cesium (137Cs + 134Cs) concentrations in bottom-dwelling fish. Total cesium being a marker for the more problematic 137cesium. The greatest concentrations of cesium were observed in fish collected in the vicinity of Fukushima Prefecture and cesium concentrations decreased with distance from that area. This is expected because the cesium is coming from a point source. However, cesium concentrations in fish, beyond allowable limits, were still observed as late as October 2012. Cesium doesn’t really accumulate in fish tissues to form high concentrations, nor does it increase much in concentration as one moves up the food chain. Given that murasoi, and other bottom-dwelling fish are exposed to cesium at the ocean bottom, these results suggest there is continuing contamination by cesium that is associated, in some way, with the ocean floor. So, why is Mike so hot? That’s easy, says Beel. Mike lives in a hot spot and is continuously exposed to a high level of 137cesium. Kenneth Buesseler. 2012. Fishing for answers off Fukushima. Science, Volume 338, pages 480-482. This entry was posted on January 23, 2013 by denstormer in Conservation and tagged Asia, environmental concerns, Japan, marine fish.